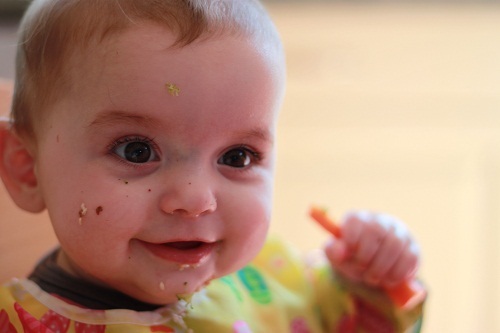 Baby Led Weaning is a term coined by Gill Rapley and in its most basic form it means allowing your child to decide when they will begin eating solid food, select what they will eat and to self feed. It may be a recent phrase but it’s not a recent phenomenon. As my grandmother said after we’d explained what we were doing, “By six months all of my boys were sitting up eating the same food as us.” So I more often think of it simply as feeding my children. I’m a big believer in there being as many ways of doing something as there are children on the Earth so although I’ll give you my take on how to approach it, only take what is meaningful to you and your baby. This section of Housewife Confidential has its own feed to which you can subscribe (options for RSS readers and email).